Phase-locked activity is thought to be an underlying mechanism controlling aspects of memory, recognition, circadian rhythms, and epileptic seizures, yet no general theoretical framework has been shown to predict the existence of a simple form of phase-locked activity, phase-locking between 2 reciprocally coupled endogenously oscillating neurons. Here, we investigate a general method for predicting the behavior of coupled bursting neurons. Previously, Oprisan, Prinz, and Canavier produced a general theoretical framework that used phase resetting theory to predict the existence, stability, and phase relations (phase-locking) of 1:1 phase-locked modes in networks consisting of 1 biological (bio) and 1 model neuron (mdl) reciprocally connected with artificial inhibitory synapses. First- and second-order phase response curves (PRCs) measured from each neuron in open loop configuration define a relationship between intervals of stimulus (ts) and recovery (tr) for each neuron, where ts is the time interval between burst onset and stimulus delivery and tr is the time interval between stimulus delivery and burst onset. When these neurons are coupled, a 1:1 phase-locked mode, that is a periodic mode of activity in a network of two neurons where each neuron fires one burst per network period, may exist if and only if these relationships are compatible, allowing the time evolution of the coupled system to be 1:1 periodic. For such cases, phase relations for the network, ts and tr, can be derived. This method is quite general, requiring few assumptions-those being that 1) the effects of a stimulus die out within one cycle period, and 2) the closed loop bursts are similar to the open loop bursts used to generate the PRCs . In this work, we extend the theoretical framework of Oprisan et al. to the case of networks with excitatory synaptic coupling. Using the Pyloric Dilator neuron from the Stomatogastric Ganglion of the American Lobster as our biological cell, we experimentally prepared 86 networks using 5 biological neurons, 4 model neurons, and heterogeneous synapse strengths between 1 and 10,000 nS. We show that the method is robust to biological noise. It is accurate for 94% of the networks we tested, if we do not include the data two from special cases, one in which the coupling becomes effectively continuous and another in which complex behavior results from a discontinuous PRC. These 2 cases represent 16% of all networks tested. 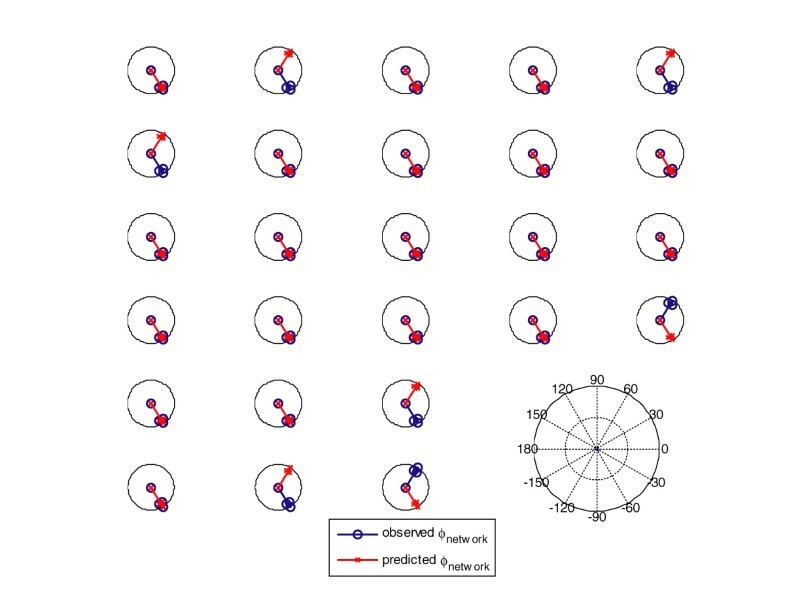 Accuracy of predicted phase relations are illustrated in Figure 1. 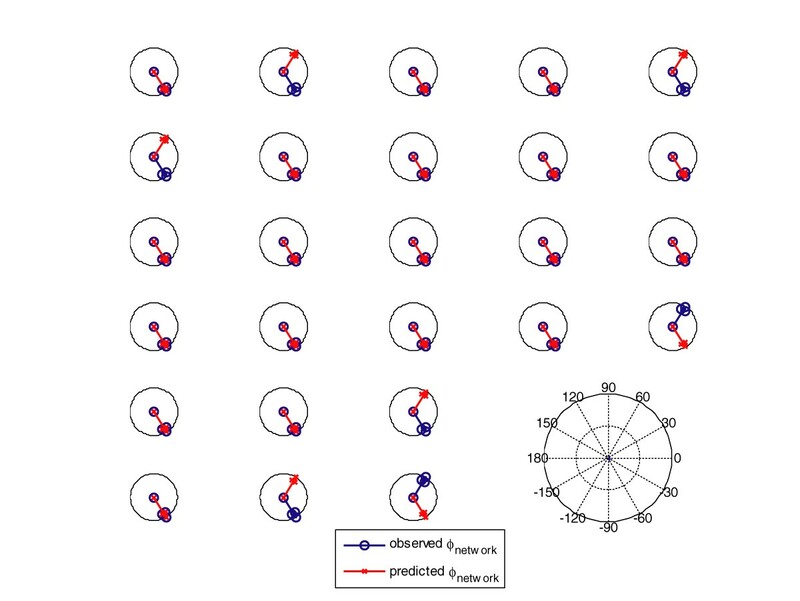 Of the 26 networks where phase-locking was both predicted and observed, phase relations were accurately predicted in 19 networks (73% of cases). In 7 networks, the phase relationships were correctly predicted, however, the firing order was incorrectly predicted, e.g. instead of the bio neuron leading the mdl neuron, the mdl neuron leads the bio neuron (23% of cases). This error is represented as a sign error in ϕnetwork. In summary, phase-locked activity in networks of reciprocally excitatory bursting neurons can be predicted from the PRCs of the individual neurons. Observed vs predicted network phase, ϕnetwork, where ϕnetwork = ϕbio - ϕmdl. Zero phase is defined as the start of a burst.